The various Oath enchantments are clearly inviting people to build a deck with lots of planeswalkers (bonus points, I assume, for using the actual planeswalkers depicted in the Oath enchantments). And aside from the question of why there weren't cards in the enchantment block Theros with similar designs that count enchantments, there is reason to think that such a deck might be fun, even if it's not top table material for Standard tournaments. 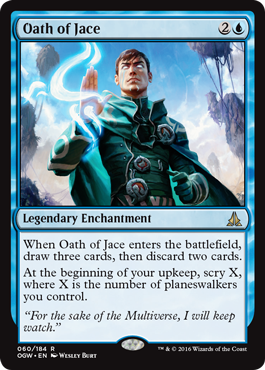 I expect Oath of Jace to be a big part of what will tie any such deck together, with both its comes-into-play ability and its ongoing benefit helping you find more planeswalkers to take advantage of the bonuses from the Oaths of Gideon and Chandra. Even a deck that's not explicitly designed along those lines might want to consider it: the card drawing is perfectly fine by itself, and enough decks use planeswalkers like Liliana of the Veil and the various versions of Elspeth as part of their default game plan that they can scry 1 most turns, which adds up over time. ...sigh. Damn it, they're trying to make standard superfriends a thing again. As it stands, This oath, is of course, the best oath, providing both scry opportunities (scryportunities?) as well as the whole draw thing. legendary status hurts it a bit, though i suppose scrying your arse off would make for super slow and broken games.